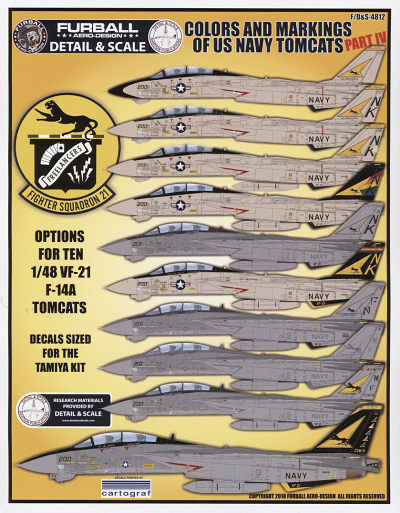 This is another set produced in conjunction with Detail & Scale, and covers ten aircraft, all with VF-21 during the unit's operation of the F-14A Tomcat. VF-21 was one of those units that started out with a different squadron number, but as VF-21 it first flew the Demon, was one of the first squadrons to transition to the F-4 and one of the last to get the Tomcat. Because of that, you won't see a light gull grey over white VF-21 F-14 as by 1984, most had been repainted in the overall light gull grey pattern. Here is a rundown of what is on the sheet. 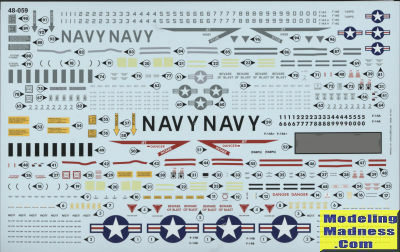 The sheet contains full insignia and what few stencils there were for two planes. In concert with other Furball Aero-Design sheets, you will find a most complete placement guide that offers snippets of information on each aircraft. 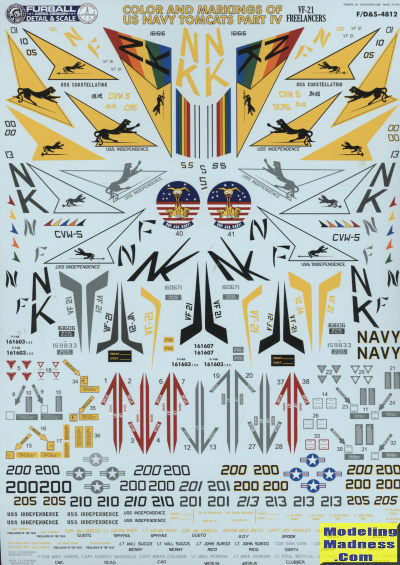 As often happens, the main sheet for this set is too long for my scanner, so some of the data markings and the wing walk areas have been cut off. The recommended kit for this sheet is the Tamiya version though you can use other kits. These sheets have historically sold out relatively quickly, so I recommend picking yours up at the earliest opportunity. Review sheet courtesy of http://furballaero-design.com. You can get yours now at this link.